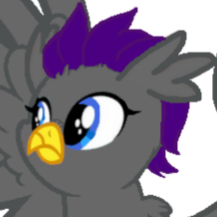 Re: FREE ART FROM HOT ROD MARE! Details: Light blue coat, mixed with some darker blue. Light yellow mane, with a cute long hair style. Pose:Winking with "her" left eye and sticking out "her" tongue. Accessories: They are wearing a blue cloak, with their hood down. 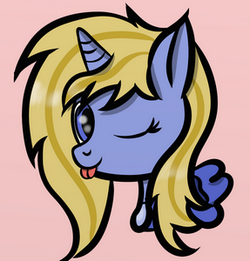 ^ Maybe a mane like this? Or something else that is cute and clearly feminine? Can you do a request for one of my best friends? It's related to the Aura Mare picture I asked. Type: Head Shot OR Fullbody. Depends on what you feel like doing. Personality: In the picture, he would have a mischevious grin about them. Details: Grey coat. Red eyes. Dark Blue mane with purple highlights. Any kind of feminine style. Accessories: Aviator goggles. Wrench if full body. Pose: Forelegs crossed while standing. Personality: Confident, motherly, skilled with a blade, sometimes a little cocky, and well-kempt and put together. Details: There's not many details to add except for a scar that goes vertically down the right side of her face, starting from her eyebrow and down to her snout. Colors. Her fur color is pure white, mane is pastel pink, and her eyes are lilac purple. Expression: Either a neutral expression, or a soft smile. Cutie Mark: Non-applicable, since I'm asking for a headshot. Accessories: Aside from the previously mentioned scar (which is usually concealed by her hair anyway), N/A. Background Color: Perhaps a simple background color, like sky blue? 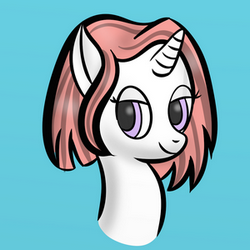 References: Balestra's a brand new character, so all I really have in terms of reference is her mane style. Personality: rough looking but kind hearted, likes drinking and can take a lot of it, hates jerks. Details:Dark brown coat, forest green mane, heavy build. Pose. Three quarter view, flintlock rifle over his right shoulder. Accessories: Georgian chocka (grey), grey svanuris hat, two flintlock pistols, one flintlock rifle, a heavy chopping sword, straight double edged dagger. References: clothing and sword references.